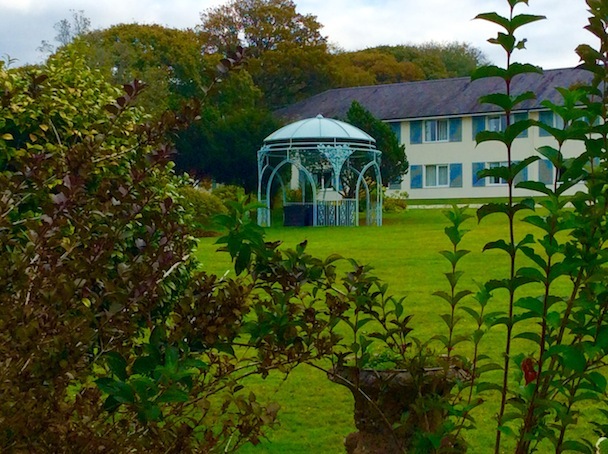 My other half had some work in Plymouth the other weekend so my younger son and I decided to join him for a flying visit on a Friday night at The Moorland Garden Hotel in Yelverton, a few miles outside the city on the edge of the Dartmoor National Park. The 80-year-old hotel was bought by Dragon’s Den star Deborah Meaden’s parents in 2011 and they’re in the process of refurbishing it, to give it a fresh, modern feel. We stayed in interconnecting rooms (my favourite way to stay en famille now my boys are older) which were nicely decorated with a bold wallpaper feature wall and new carpets. The rooms were warmly heated which was really welcoming to walk into on a chilly Autumn evening. The hotel is set in nine acres of gardens – you can see the view from our room in the pic below – and there’s a gated field where you can let your dogs have a run off-lead (away from the sheep which graze in clearings around the hotel). We ate in the hotel’s Wildflower Restaurant which overlooks the moorland garden and has glass doors leading out onto a dining terrace. The restaurant has recently won an AA Rosette and our food was delicious. We enjoyed delicate starters of Plymouth gin cured salmon with cucumber and wasabi plus a Pickled beetroot Carpaccio and syrup with Vulscombe goats’ cheese and celery salad. Our mains were good too – Roast Wood pigeon with spinach, onion puree , Dawlish chanterelles and Plymouth sloe Gin jus plus a Tomato tart tatin with grilled halloumi wrapped in courgette and rocket salad. Dessert was a tasty chocolate delice with poached aged prunes and Earl Grey ice-cream. The only downside for me was the bright lighting in the restaurant – some ‘mood’ lighting would have given a more cosy ambience. With its location on the edge of the Dartmoor National Park, you’re spoilt for choice when it comes to walking. 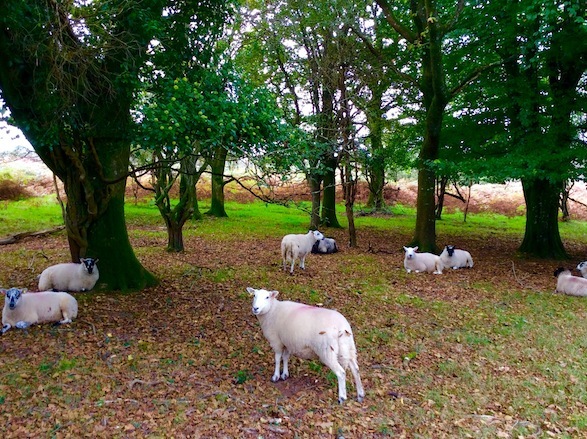 We tackled a short section of the West Devon Way between Yelverton and Tavistock. Then it was into Plymouth – about a 10 minute drive away (which makes the hotel a good base if you’re visiting your teenager at Plymouth University). We enjoyed a couple of hours wandering around the Barbican harbourside, looking at boats, having an ice cream and pottering around craft shops, as you do (we particularly liked Rockpool Trading a cosy shop selling locally made, handcrafted gifts and homeware). There are plenty of places at the Barbican to stop for a coffee including Rockets & Rascals, a coffee and bike emporium (my other half, a keen road cyclist has a nose for sniffing out these types of places). The coffee (and cake) were great and they also offer bike hire for exploring the city or further afield. It’s currently £45 for a family of four for the day (or you can hire for just two hours for £30 per family). We spent the rest of the late afternoon exploring Plymouth Hoe, with its historic lighthouse Smeaton’s Tower and outdoor lido. It was a lovely (if all too brief visit) to Plymouth and we hope to come back to further explore the city and get further out into the Dartmoor National Park in the future.